At The Demand Creator Blog we spend a lot of time evangelizing the importance of content. Content marketing is already critical to the success of any B2B lead generation or successful sales process. The truth is that it doesn’t matter how good your content is if people don’t read it. While quality is important to single biggest determinant in getting your content read is your headline. 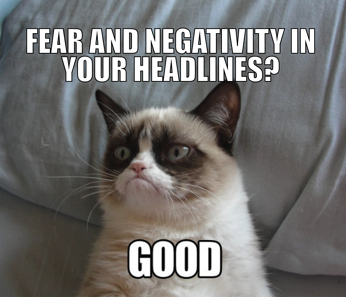 A good headline can make a 5 – 10x difference in how people engage with your content. Iris Shoor shared some insightful research into The Dark Science of Naming Your Post. Her research backed up our experience about some key principles to use when naming your blog posts, white papers, webinars, etc. And while encylopedias can be written on the keys to good headlines, here are three of the most important principles to follow when creating headlines for your content. If you’ve ever watched an episode of Who Wants to Be A Millionaire or Deal or No Deal, you understand the psychology of loss. While we all like to talk about our dreams and desires, the reality is that gain does very little to motivate behavior or even interest. What’s the problem that won’t be solved or the opportunity that will be missed if someone doesn’t know what I’m sharing here? Remember, action takes place when structural tension is present. In order to get someone moving, you must reframe issues so that they realize that the status quo is no longer viable. 2. It’s better to be simple, strong and wrong. This bullet is an example of the second principle. Too often businesses look to communicate too precisely. We worry too much about being wrong. The problem when you’re focused on communicating in a way that people can’t disagree with you is that you get very nuanced. For example, in the “Eliminate The Costs…” headline, one would be correct in arguing the point that you can never eliminatethe costs, as there will always be some costs there. While that’s a reasonable position, it’s unlikely to drive engagement. Andy Rooney was great at this. I remember watching him with my parents at the end of each episode of 60 minutes. His commentary was always simple and very easy to disagree with – and that’s what made him so effective. Howard Cosell was another person who was naturally great at this. I remember when he was broadcasting he regularly showed up as the #1 in both the most liked and disliked sportscasters in the market. You may have loved Cosell or hated him, but you couldn’t argue he was relevant. Our third point really covers two ideas. First, people like numbers. Let’s take our sample headline above. A great way to improve it would be to add a number to it. For example: 5 Ways to Eliminate Costs Hidden in Your Supply Chain. An interesting finding from Shoor was that the bigger the number the better. So don’t be afraid to publish an article or to host a webinar on the 37 ways to do something. Oh yeah, the second point. Numbers matter. When you’re writing for business purposes you’re not writing for a Pulitzer. You’re looking to move the needle. A post is as good as the engagement you get from it. Do people read it? Do they react to it? Does it provide measurable ROI? Yes, quality counts, and the numbers matter. So test, test and test. Keep playing with things and watch your numbers. You’ll learn real fast how to drive continuous improvements.